12:53:00 AM Yea soloing these guys isnt to hard just time consuming. Root works wonders on then and then just keep running in circles. 11:46:00 AM You realize, He's proably dead and the krayt juist lay down next to his corpse. That's the best way to take up close pics of krayts. Let it kill u. 6:45:00 PM I'd hunt them, even if they didn't drop pearls. 9:21:00 PM they are both rare creatures. 6:29:00 PM For those who have the sg8 whatever that crappy cold rifle for novice marksman lol its your best bet against these lol... wish they would make more weapons with cold... like the blacksun exicutioners hack. The scyth was kinetic and they made the hack it too.. and the hack is weaker how sad. and alot of creatures like the skreej elite and the malignant squill have cold res. its pointless in a way. 3:22:00 PM And that's exactly why they nerfed CH. We were too powerful once too. Enjoy it while you can, I'm sure the devs will screw jedi up too. 11:39:00 AM I have a Jedi Knight that is master force wielder / master lightsaber. There is an attack in force wielder that allows you to agro any wild creature onto your current combat target (it's call /animalAttack). I found an ancient spawn pulled it away in order to get a second one to spawn at the spawn point. I agroed the second ancient onto the one trying to eat me and then I used dervish 2 on them both (cone attack). Took no more than 10 minutes to kill them both at the same time. 11:04:00 AM Man... How come BE's get Kimos but we can't even get a lesser krayt dragon baby :( its not fair!!! 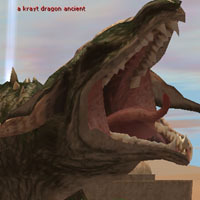 I WANT A KRAYT!!! 3:34:00 PM hm, i dont think its even possible to dish out 26 000 damage per second.. show me a guy who can do that :P, not against this!. unless a jedi but that damage is still too high. 10:20:00 AM Oops, my mistake. You were right. it's 72 million. That means that the guy who claims to have dealt slain one of these by himself in 45 minutes was dishing out about 26,000 damage per second. Not bad! 10:15:00 AM I believe the Eff vs Kinetic and Eff vs Energy ratings are a little off. They should both be 9 million instead of 72 million. 10:05:00 AM .....why is the babies mod set to unkown? correcting this now. 8:46:00 PM eh you guys are lucky my friend is tring to celebrate me becoming a mster ch by taking me to kraytes0.oand hes tring to make me attack when I'm a novice tka! 5:09:00 AM Well Im Master BE and we cannot Crafte these Krayt dragons. We only craft Kimogilas and Low limit is 40 on them. The skin on a BE pets only have with the concern with speed/ranged attack/aggro/low limit CL nothing more. 11:10:00 PM Master Commando and Master TK, Fully Buffed, Brandy, etc took one down in 45min. Flame it up and wear FULL COMPOSITE ARMOR and it doesn't BARELY TO NO DAMAGE TO YOU! Just be sure to have some medic skill to be on the save side. 1/1/0/2 would probably do it. You get 500+ bone, hide, or meat with Hunting IV. They are pretty easy, just really time consuming. 2:18:00 AM For the love of God!! How are we soposed to kill one of these!! With CryoBan's!!! 7:59:00 AM SniperFZ wrote: "Don't ever think you're at a safe distance when fighting these guys! I was not even in range with my T21 and he smacked me. Hmm maybe it was lag?" --------Partially, but what a lot of people don't realize is that these beasts can move FAST over LARGE distances when they agro. I've seen these things move so d**n fast it looks like they're just teleporting. The ancients can hit you at 80m with a ranged strike, but all krayts have a ranged attack of some variety. 8:36:00 AM SWEET JESUS MARY MOTHER OF GOD!!!! THIS THING IS INSANE!!!!! 7:13:00 AM i dont knwo but i got one and im a master ch i bought it so you can get one lol. its great. 7:35:00 AM You can't sample creatures this high in CL. End of story. 9:48:00 PM Can you BioE these or not? 4:46:00 PM Don't ever think you're at a safe distance when fighting these guys! I was not even in range with my T21 and he smacked me. Hmm maybe it was lag? 6:45:00 PM CL75 is the highest that can be sampled. 12:44:00 PM Can you BioE sample these guys? 8:23:00 AM Krayt Dragons have Force Strike? I though they were just really strong and big lizards.